The Salewa Atlas was initially a bit of an emergency purchase. I set off rather hurriedly on a canoeing trip last summer, only to find I'd left the poles for my trusty Phoenix Phunnel at home. Fortunately, a little voice inside my head made me carry out one final check before we cast off. I plunged my hand into the bag as if it were a lucky dip and scrabbled around. Just about everything was there - the inner, flysheet and pegs. But there were no poles and without them the Phunnel was rendered useless. Thoughts of fashioning a set from tree branches quickly gave way to some good old fashioned cursing. On the first night of the expedition I managed to squeeze into someone else's nylon shelter, but it was far from ideal. Fortunately the following day we stopped at Aviemore where I set off in search of a new home, clutching my ever-faithful Visa card. A visit to Ellis Brigham in the High Street offered two choices - a selection of very solid, but expensive North Face tents in an assortment of sizes, or a considerably cheaper Salewa Atlas, available in three or four-person sizes. Mr Visa plumped for the Atlas III - the three-person model - and I made my purchase. One hundred and fifty pounds was sliced off the credit card, but I was content in the knowledge I would no longer have to impose myself on others, or bivi out in the midges. I spent the rest of the day lost in a world of eager anticipation. When we reached our campsite I wrenched the Atlas from its protective wrapper and set about pitching. A good clear set of instructions is provided, in an assortment of different languages and accompanied by diagrams. The Atlas pitches inner first. Lightweight aluminium poles pin into adjustable tension bands on each of the four corners and the nylon inner hooks up on to the metal skeleton. This provides a nice taut arrangement. Once the polyester flysheet is thrown over the top and manoeuvred into position the four corners are also attached to the ends of the poles. The whole structure can then be picked up and moved around until you find your perfect pitch and peg it in. In good weather the base pegs are sufficient, but there are guylines for more serious conditions. The only problem here I found is that the inner and flysheet sit very close together and you have to be very careful to keep the two apart. The outer could do with being just an inch or two larger. Inside there is plenty of space. The Atlas sleeps three in reasonable comfort but is perfect for two, with bags of room to spread gear around. There are two large pockets, one on each side, for personal items like specs and watches, plus Velcro-fastening vents in the flysheet to provide ventilation. The inner is just over a metre high at its apex, providing plenty of headroom, and the hooping poles and high walls make the whole thing feel very spacious and airy. There are inner and outer doors front and back with vestibules at both ends for cooking and gear storage. The Atlas packs down to 3.9kg, a good weight to split between two backpackers. The elasticated poles break into short sections for easy packing and the inner and outer bundled into compact roles. The posh gold coloured pegs are a touch on the heavy side, but are easily replaced with something lighter if you so choose. The tent stood up very well on the canoeing trip to some fairly wet and windy conditions and, despite the reservations expressed about the proximity of the inner and fly, we had no leaks. It has since been used repeatedly on backpacking trips both by myself and others since and has performed very well in a range of conditions, even in high wind. Overall this has been an excellent value purchase, offering easy, flexible pitching, good inner space and reasonable weight. 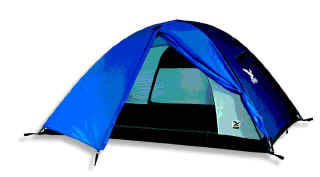 It is stable enough for low level use throughout the year, and three season use if you camp on higher ground. As with other Salewa tents, the Atlas comes with a selection of material patches for repair, although a year from purchase these haven't proved necessary. A larger Atlas IV is available, sleeping four people.